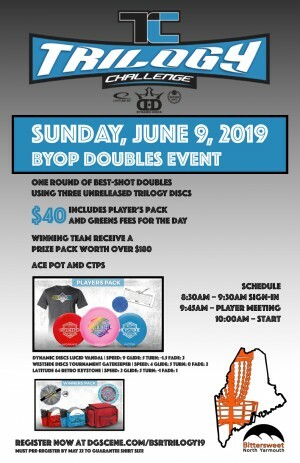 Join us Sunday, June 9 for a BYOP one-round best-shot doubles Trilogy Challenge on the Sweetside at Bittersweet Ridge DGC in North Yarmouth, ME. Your $40 entry fee gets you three brand new unreleased discs (details below), t-shirt, mini, scorecard, and pencil, as well as greens fees for the day! There will also be CTPs available as well as an optional ace pot (payment for ace pot collected the day of event). You are only allowed to use the three discs provided in the player's pack during the tournament. Register by May 22 to ensure t-shirt size. Maine Junior Disc Golf is responsible for all refunds/cancelations.